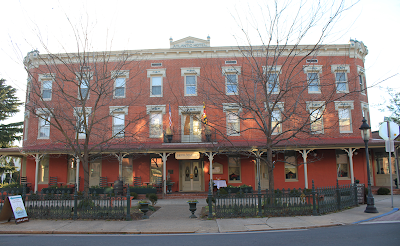 I had the opportunity to be a guest at the Victorian-era Atlantic Hotel in downtown Berlin, Maryland last weekend. I've been familiar with the hotel for years and lunched there several times. It's the kind of building that causes you to slow down and look ... to turn your head. Yes it was featured in the Runaway Bride and yes Julia Roberts had a memorable scene here. But I don't care much about that drama. 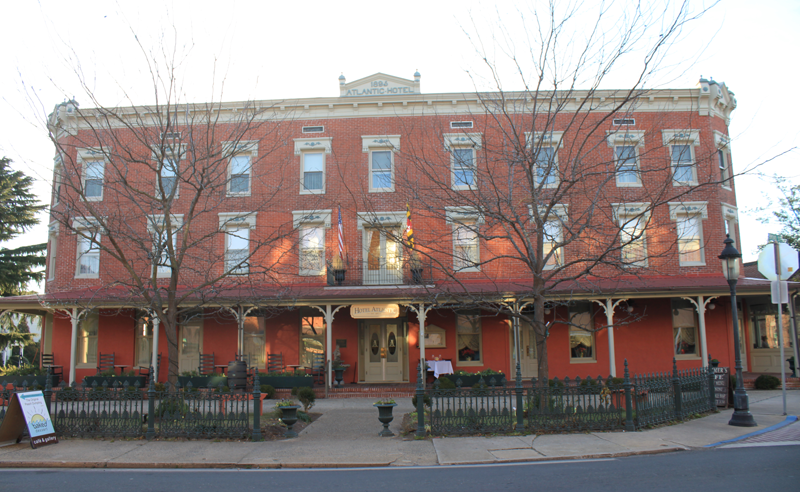 The magnificently restored building in the center of one of Maryland's most picturesque historic towns has a drama all its own - unique unto itself. One could spend hours here - or days. The turn-of-the-century ambiance is palpable. And that's enhanced by some turn-of-the-century spirits that may still linger here. My plan was to attend the Maryland Life Magazine's launch party highlighting their newly released November / December 2010 issue. My book review of The Eastern Shore Cookbook by Whitey Schmidt appeared in this issue. I wanted to show my support for the magazine and for the Eastern Shore localities that were featured in this issue. I saw a $50 room rate special for that night only - too good to pass up. I booked a room and had Dan Burgoyne meet me at the party. Afterward we had a fabulous dinner in the hotel restaurant, and dined to live piano music seated at a table for two by a large window on the glassed in porch that overlooked the historic main street decked out for Christmas with Victorian decorations. Talk about holiday eye candy! Some of the best food on the Shore. I'm no food expert, but I could rave all day about the Prince Edward Island steamed muscles and the broiled lamb chops. Dan had fried calamari and a New York strip steak and both of us had dessert (though we didn't need it). Our server started us out with a "fine wine by the glass" list. I told her to suggest something - as I'm not a wine connoisseur. Boone's Farm tastes good to me. (hee hee, my husband hates when I say this). She suggested a Cabernet and the wine flowed throughout our dinner in a setting that would rival any Currier and Ives print (save the snow). The ambiance was perfect for setting our dreams in motion about destinations in our future. Then we moved to reflections, memories - happy and sad - of Christmases past. After dinner we ascended the first of two staircases and retired for the evening in Room 23. I checked in before Dan arrived, and made a mad dash to the room to change and freshen up. When I came into the room, I had bags in both hands. I remember letting the door slam behind me. When I was ready to go downstairs. I noticed the security bar (the one found on the guest side of the hotel room door that you flip over as a security lock) had been moved to the "locked" position. I found this odd because I knew I didn't lock my door, in fact I couldn't have because my hands were full. There was no one else in the room but me. How could it have gotten locked? Even though the room was small (still a deal for $50 a night), all the significant extras were included - flat screen television, cut glass water goblets, soaps, lotions, hair care products, bathrobe, lots of fluffy towels, and high thread count sheets. The iron bed was very comfortable. ...but for no good reason, neither of us could sleep all night. As soon as we'd fall asleep, we'd wake up. Neither of us got more than one consecutive hour of sleep. Strange. In the morning we had a great breakfast at Rayne's Reef and then shopped in the antiques store and visited a few galleries. At noon, I returned to the hotel front desk to check out. There were two ladies behind the desk and a man, casually dressed, looking in the phone book. I asked (as I always do) if the hotel had any ghosts. Immediately the man said, "I don't do any more work in room 24." He was staring straight ahead, looking at no one, speaking rapidly. He continued, "I lost my paint scraper in room 24. Had it one minute, gone the next. I looked and looked. I had to go back to the shop to get a new one. When I came back to the room, there was my paint scraper standing straight up on its end in the middle of the room. That was it for me. I told them... I ain't working in that room no more." Then the girl behind the desk admitted she hadn't worked there long, but she had issues with lights spontaneously going out as she walked past them. She demonstrated how the lamp on the desk would just go out. Then it would come on again later. She said one light would be explainable, but two - three - four - six. All at different times. The just go out. There's nothing wrong with the bulbs. They just go out. At this the man said, "I don't even believe in these things - Do you hear that? (talking to the ceiling).... do YOU hear that? I don't believe in ghosts. But it's something you can't explain." I told them what happened with the lock in my room #23. The man said, "See? Right next to room 24. I don't go in there ANY more." Then the girl said, "You know room 18 has a problem with the door always closing. The housekeeping staff props it open because they're startled when it closes by itself. I was in there once fluffing pillows and tidying the bathroom. When I went to exit the open door, it shut, almost slammed, just as I was about to go through it. So I went outside the door, in the hall and tested it. I left it open and stayed five or ten minutes. Then I moved it to a more 'closed' position. It never budged. It only closes when it wants to." So I mentioned that someone in the antique store said there was a child that haunted the hotel. The man said said, "Yes, a little girl. She rides her tricycle down the halls at night. The guests hear the creaking. Some have seen her" Then obviously agitated he said " ..... but. .... but... don't tell me anything. I don't want to know about no ghosts. I don't want to know who died here or something bad that happened here. I don't believe in ghosts. Do you hear that?" Looking up to the ceiling he repeated, "Do you hear? I don't want to talk about this any more." Lounge on second floor. The hallway outside this room is where the child playing is often heard late at night by guests. The other lady behind the desk (who hadn't contributed to the conversation) said someone told her that spirits attach themselves to things, like the antiques. Some believe that during the recent renovations at the hotel, spirits were disturbed, perhaps angered. Some believe that the antique furniture recently purchased to furnish the hotel came with "spirits attached" ... that means the ghosts may not even be local. Guest ghosts - fitting for a historic hotel? Regardless of whether or not one believes in ghosts, the Atlantic Hotel is worth a visit and an overnight stay. The rooms are stunning with all the amenities one expects in a fine hotel. The food is exquisite, the bar - casual and fun, and the wide porch rockers offer a relaxing venue for people watching or chatting with a friend. The added benefit of the hotel anchoring a historic downtown full of shops, galleries, an antique mall, tea room, and the Globe Theater - all in close proximity to the Atlantic beaches including the Assateague National Seashore with it wild ponies make the Atlantic Hotel a worthwhile Maryland destination. If you're a ghost hunter, or fascinated by ghost stories, you only need ask a member of the staff or a Berlin local to entertain you with the tales. For the full effect, check in and spend a few nights. It is beautiful, Kelly. I've driven past that hotel for years and always wanted to stay there. Now I'm sorry I didn't stay sooner. Hope to go back. Maybe take a group there. I had always wondered if that place was haunted! I need to stay a night one time!! I have eaten there before and it was very good! Hmm.....weird!! Sounds like a nice hotel, though...may have to check it out sometime, although I'll get plenty of sleep beforehand. My name is Maria and I am the girl at the front desk who told you about the lights and room 18. I wanted to thank you for writing such a lovely blog about the hotel. I will be staying in the hotel over night on December 2nd... in room 24 actually... so I will fill you in if anything exciting happens! Thanks for the comment, Maria. Be sure to keep us posted on your stay in Room 24. I can't wait to hear. Happy Thanksgiving. Although I am finding it months after its publication, splendid article on a grand old hotel. Looks like the Atlantic would be an excellent place for a good old-fashioned ghost hunt/expedition. Though I'm not a practitioner of paranormal research, I have many friends who are. The Atlantic Hotel would be an awesome place for an investigation - not to mention, just an awesome place period! Thanks for taking the time to comment. I stayed there when I was 15 in 2007 w/ my family I stayed up after everyone was asleep I was on the phone w/ my then & current boyfriend when the shower turned on by itself, it was an older model tub with a Victorian look and I vividly remember the water pressure was extremely intense it poured out of the shower head w/ such great force the shower curtain blew out w/ air from the air circulation due to the water pressure I was totally spooked I woke my step dad up to turn it off. By the look of the place, my family & I assumed it was haunted the moment we checked in. That incident just confirmed our suspicion. I am actually planning on staying again this weekend depending on the rates. I loved the hotel it was amazing and beautiful as was the small historical & antique like small town surrounding the hotel. I figure its close enough to go to OC everyday & experience adventure & beauty while were at the hotel. I'm just hoping the rates are affordable. I will post again about this stay if we are able to get a room this weekend. -Erika. thanks, Erika - and all who have shared their experiences here. This is such a beautiful old hotel. Definitely worth the stay whether you like haunted experiences or not. It was fun doing the research for this post. Everyone was so willing to share, and EVERYONE had a haunted story about the hotel. I was married at this hotel back in 2010. My husband and I go every year. I had no experiences because we stayed in the cottage, but my family said they felt a little weird. We are going back this weekend, and I cannot wait!!! It is absolutely beautiful there this time of year. Thanks for the stories... I try to get stories out of the staff every year but they are always so hesitant on saying anything other than it is in fact haunted. What a beautiful place for a wedding. Let us know if you get any new staff stories. Try asking maintenance workers or restaurant staff. Thanks for taking the time to read and comment. We love hearing from others. I do believe in ghost and they reside on old houses or buildings. That hotel needs some restoration or if the owner got some budget, they can make another one. Demolish and create a new hotel. A group of friends and I stayed in Ocean City last week, and had a wonderful dinner at the Atlantic Hotel's Drummers Cafe one evening. They allowed us to wander the two floors of the hotel after dinner, and we definitely felt a bit of the paranormal. My one friend's camera actually turned off, then back on spontaneously ... near rooms 23 and 24, no less. My other friend took a picture of me where the stairs go from the 2nd to the 3rd floor, and there was a large orb near me. Right after that, she tried to take a few more shots in the same location, and about 5 times, we saw 'something' going across her screen in different parts with each picture. It was VERY exciting! Nothing menacing, but definitely something going on there! We will definitely return to Berlin and the Atlantic in the very near future!